If you have purchased clothes in the past merely because they were cheap or “just for fun” garments, then I have a suggestion for you! Next time to you choose to go shopping, I suggest you change your mindset and perspective. Cheap clothing items may leave you excited the first or second time you wear the garment, but when it is wearing out after only a few times of wearing it, you may be second guessing your decision. In order to prevent this feeling of regret and hopelessness, I suggest considering splurging on high-end menswear garments. You may ask yourself why pay so much on one item when I can merely get multiple pieces for the same price. Well, this is why you need to read this guide. Let’s take you through some important reasons why you should buy for quality, not quantity. In the industrialized world, we live in today; cheap clothes are everywhere. Once you go to a regular store, you can quickly get piles upon piles of jeans that cost no more than $20. However, you will agree with me that all that low-cost is produced, sold in large quantities making them poor in value and can be bought by just any random fellow. High-end menswear, specifically a pair of designer jeans, can range anywhere from $150-$400. It’s not just the label that causes the price to skyrocket, it’s the fabric, production time and quality, design, fit and attention to detail that is put into each and every pair of jeans. Each pair of Paige jeans that is made, is touched by 27 pairs of different hands before being wear tested to make sure they pass the quality inspection test. Because of this process you can be confident in your jeans to last you many years to come. Another designer denim brand we carry at Blaine’s, is Jacob Cohen. Again, Jacob Cohen jeans are made from some of the best materials and fabrics out there, but one attention to detail and unique touch that Jacob Cohen implements into their jeans, is that their jeans are scented. Yes, you read that correctly, they actually all have a scent embedded into the denim, so no matter the task, you’ll always be smelling great! Not only does high-end menswear like to have some fun with their garments, but they are very practical purchases if you calculate how much your cheap clothing costs and how quickly it wear and tears. If you find this hard to believe, this is true. Although you spend more when purchasing a quality cloth, however, such a garment will last longer. When you calculate the cost per wear after purchase as opposed to the upfront cost, you will agree that cheap clothes are expensive. Quality Clothes not only last longer but are more comfortable, and make you look great once you wear them. Most importantly, you can’t just get them anywhere. Hence, rather than investing your money on mediocre stuff, why not spend that cash on a few nice things that will last longer. The principle of comfort is simple - spend more cash where you spend most of your time. This is why it’s an excellent idea to splurge on that high-end menswear, comfortable desk chair, or a nice mattress, depending on how many hours a day you sleep, relax or use that mattress. Let’s face it, most of us wear clothes throughout the day (sometimes through the night). We wear them at home, to work; in fact, every occasion we go to have its dress pattern. Hence, why not spend more on clothes that can provide happiness out of your time. You need to wear clothes that make you look great while at work and are comfortable. You need gym clothes that will make you look fit and handle the stress of your workouts. Since you wear clothes every single day, buying clothes is an experimental purchase. No wonder, research suggests that this is one of the ways you can buy happiness. Although, clothing is not an investment in the real sense (because it never appreciates and you will never sell a cloth above the price you bought it); however, you can still see it as a down payment on your confidence in your appearance, on your daily comfort, as well as the utility of your closet. For instance, buying a couple of cool jeans that will make you look great, and last long longer is better than having dozens of jeans that look just “okay,” not really comfortable and will fall apart after one season. Furthermore, spending $250 on single high-end menswear garment may seem like a lot; you tend to enjoy it later on compared to paying $40 on three-pack of basic t-shirts. You spend the most time in your clothes, so why not go for nice ones when you know you will wear them all the time. When you have about 10-20 quality garments in your closet compared to 50 cheap clothing, deciding what to wear in the morning would be quicker. You would also look confident and love the way you appear that morning. When you have a wardrobe filled with lots of cheap clothes, the thing may get to bad that start to feel frustrated about what you should wear especially when you are going out to a special occasion. This is why it’s even better to have a minimal wardrobe because having few good options is better than having lots of common options. Defined style: Having a few quality clothes in your closet will help you determine your style rather than wearing a hodgepodge of styles, colors, fits, patterns and materials. A minimal wardrobe enables you to define that unique style whether casual, basic, thrifty, edgy or hipster-ish. Create better outfits: This may sound strange, but for most people, the lesser your clothes, the better outfits you have. 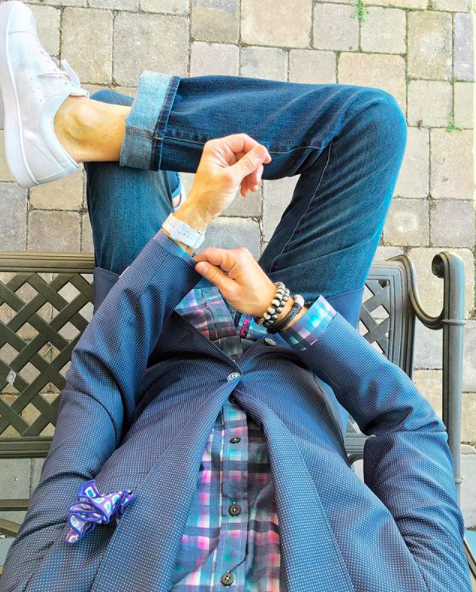 You may like to the basic style while dressing and not know how to go about it. Save Time: For many of you, you are busy. Whether you’re a businessman, stay at home dad, world traveler, whatever the case may be, you don’t have a lot of time on your plate to schedule and plan outfits. Studies show that the more options you have, the harder it is to make a decision. If you have noticed, top entrepreneurs and leaders like Mark Zuckerberg, wear roughly the same outfit every single day. They want to be able to make a quick decision when it comes to what they are wearing that day so that they can save brain power and decision making for when it’s crunch time at work. People have different sizes and shapes; most cheap clothing is mass produced in a single fit for everyone. For instance, low-quality shirts look terrible on individual not shaped is a particular way. When a shirt is too tight or too loose in the wrong places, you end up feeling vulnerable or uncomfortable, and this reflects in your body language. However, when your clothing fits you well and gives you comfort, then you can have a nice confidence boost. Using the same instance, quality garments are produced in a variety of cuts; hence, irrespective of your shape, you can still find one who will feel comfortable after wearing. Even when you can’t, you can still get it fitted to your size later on. If you like it or not, you can’t deny the fact that clothing is part of your identity. The clothes you wear determine your social status and also the level of your professionalism. Therefore, a few quality outfits can give you that awesome look which takes exudes pride in your appearance. Spending on quality outfits may look frivolous if you are a frugal person. However, sometimes, you don’t have a choice but to spend money particularly when you want to network with colleagues or land a job. When you buy high-end designer as opposed to Forever 21 and H&M garments, you don't have to worry about trends changing and styles fading. Designers are beyond knowledgeable about upcoming trends and fashion trends and typically lean more towards the classic side. The fashion world thrives off innovation, and if not for trends, the industry would lose its value. Hence, most designers and top brands observe trends with upmost discretion, choosing and picking adaptations to their classic style while secondary brands simply follow trends. However, both fashion and style are greatly influenced by celebrities today. Sometimes, people get into the news just because of what they are wearing. There is a glitch to this, as sometimes people do not follow a trend invented by a celeb (e.g., Beckham’s sarong). However, on the other hand, when the timing is right (like when Beckham sported a mohawk), celebrities can significantly influence what we wear as well as our hairstyles for a while. What’s more, fashion is also considerably driven by the fast-moving media, news, and television. However, unlike trends, classic styles are not always driven by fast-moving media but by icons, so it better to think like an icon and go for classic garments. For example, in the 1950s, the black leather jackets are only worn in iconic movies. Not just that, only the best characters are seen wearing one. When you tell a man to upgrade his closet, the first thought that comes to mind is that you are saying he should go shopping. At times, maybe you don’t need to buy new clothes, you merely need better-fitted garments. A good fit makes the difference a muumuu and a cute maxi dress, a clown suit and a GQ-approved suit and a “mom” jeans and high-waisted jeans. Fit can be a problem especially when you are petite. This is the exact issue Menswear designer Jaden Lam faced. With a height of 5 foot and 6 inches, Lam told HuffPost style he had always struggled to get clothes to fit his body. However, the problem is not size, after all, most menswear also has small and extra small sizes. The issue is with the fit. Lam also buttressed that standard medium, smalls and extra small are all too big. The CDC estimates that the average American male height is between 5’7 inches, and 5’ 8 inches; most menswears is made for men 5’10 and up. Lam believed that all men like him are facing the same problem. They have to sacrifice everything from style to fit. Therefore, he decided to create a line of men’s clothing that specializes in smaller proportions for men 5’9 inches and below. Today, other brands do the same. This illustration displays that it’s the fit and not just the right size that makes all the difference when trying to look good. By now, I am sure this guide has exposed you to the importance of getting high-end menswear in your closet. Most people don’t know how expensive cheap clothes can add up to be, nor do they know that it is better to have a wardrobe of a few top quality clothes than have one with a lot of cheap clothes. What you wear determines how you are viewed. Hence it is wise to spend more on high-end clothing because good clothes not only make you look good, but they make you feel good too, giving you the ultimate confidence boost. Therefore, you need to take action from now on. If you want to get high-end menswear, there is no place better than Blaine's Fine Men’s Apparel in Montgomery, Oh. When you think of high-end designer menswear, your first thoughts are probably formal wear. The first expensive menswear garment that comes to mind for most people would be a suit. At Blaine’s, we are famously known for having the best Italian men’s designers from around the world. However, high-end menswear doesn’t just end with suiting. We suggest having a well rounded quality wardrobe, including everything from your jeans, sweaters, sport shirts, sneakers, all the way down to your belts, socks, and underwear. Yes, we even believe in high quality underwear from Saxx, because if you don’t feel comfortable in your underwear, how are you going to feel comfortable in the rest of your outfit?